Despite the numerous studies and success stories that prove the effectiveness of therapy, there are many people who are still hesitant to try it. At Dr. Eliana Cohen Psychology, we want to provide our patients with the help that they need. Whether you’re interested in couples counseling, mental health counseling, or something in between, Dr. Eliana Cohen and her associates will give you the personalized attention and assistance that you deserve. Learn more about our many specialties, and call Dr. Eliana Cohen Psychology in Toronto to schedule an appointment. Unfortunately, one of the main reasons that people are resistant to therapy is because there are so many myths about it. In today’s post, we will debunk some of the most common myths about therapy. Once you have finished reading, if you think that you can benefit from speaking with a psychologist, call Dr. Eliana Cohen. Myth #1: Why go to therapy when you can just talk to a good friend? Talking with close friends and family members is always a good way to cope with a stressful situation, but it not a substitute for therapy. In most cases, talking with a friend is a give and take relationship. You and your friend or family member will go back and forth discussing your problems or trying to find ways to relate to each other. In therapy, the entire session is devoted to you and solving your issues. Not to mention, psychologists spend years in school learning how to diagnose mental health issues, how to help people cope with their situations, and much more! In addition to focusing solely on your concerns, therapy is also a great way to get everything out in the open. As much as you don’t want to admit it, when you talk to your friends, there’s a better chance that you will censor what you say so as not to offend anyone. In therapy, you don’t have to worry about hurting your therapist’s feelings or worry about judgment, making it easier to be open and honest. Myth #2: Only people with “serious” problems go to therapy. Most of the time, people assume that in order to go to therapy, you have to have been diagnosed with a serious mental health issue or be ready to kill your spouse. However, the reality is that you can go see a therapist at any time for any reason. Whether you’re having a hard time coping with stress, you feel depressed, or you just need an unbiased listener, there is never a bad time to see a psychologist. Myth #3: Therapy is a sign of weakness. Another one of the main reasons people don’t go to therapy is because they see it as a sign of weakness. In reality, mental health conditions are still health conditions. Your mental health is a huge part of your overall health and wellness. If you had the flu, you wouldn’t hesitate to go to the doctor, so why should you hesitate to see a therapist when you have mental health issues? Just like medicine is the right treatment for the flu, therapy is the way to treat your mind. Myth #4: All therapists are the same. Therapists are people, and while you may find that some have similar ways of treating you, no therapist is going to be like the next. There are many different treatment options, and some therapists may prefer one treatment method over another. For example, you may find a psychologist that prefers to treat his or her patients with hypnosis, while another psychologist may prefer cognitive behavioral therapy. The key is to find a therapist that offers a treatment that fits what you are looking for, and in some cases, that may require that you visit more therapists than one. Myth #5: You can handle your problems by yourself. Thinking that you can handle your emotional and psychological concerns by yourself goes hand in hand with thinking that going to therapy is a sign of weakness. In reality, going to therapy will give you the tools so that you can deal with your problems on your own. It would be like trying to open a restaurant with no instructions on how to cook. You may have a natural ability that can take you a long way, but without a little instruction, it will be a lot harder to become a success. Therapy gives you all the tools, skills, and guidance you need to make coping with your problems easier to manage alone. 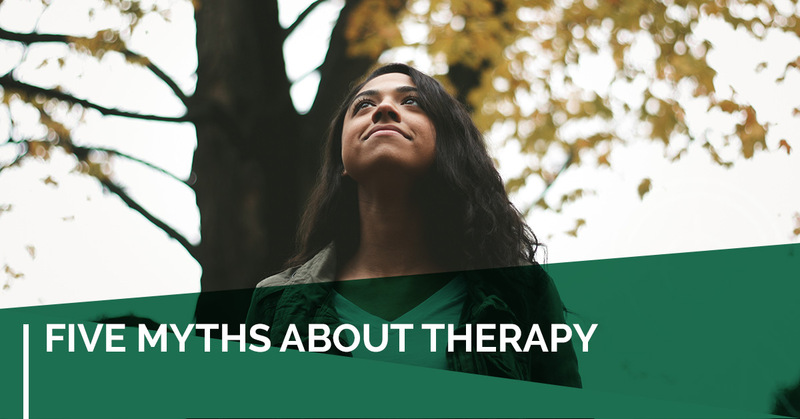 These are just a few of the common myths that are associated with going to therapy. Like many things, you won’t know for sure if therapy is for you until you give it a try, and if you’re in the Toronto area, Dr. Eliana Cohen is more than happy to give you the guidance you need. Check out our full list of services and give Dr. Eliana Cohen Psychology a call today to schedule an appointment. We look forward to seeing you soon.